Need a New Water Heater Installed? Are you running out of hot water during your shower? Is your water heater leaking or making weird noises. It may be time to replace your old water heater. State-licensed California plumbing contractor, certified by the major manufacturers of water heaters Such as Rheem, Bradford White. Our installers are all experienced, insured, and highly qualified to install all types of water heaters. Providing free consultation on what is the best and most efficient type of hot water system for your needs. We carry a huge inventory of water heaters in every size of all major US brands. We carry gas and electric-powered water heaters, solar heaters and tankless water heaters. Install your new water heater the same day you call. And we will haul away your old one and dispose of it correctly. 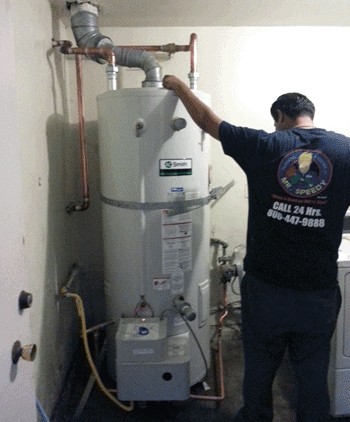 We follow the highest standards for water heater installation, with hundreds of satisfied customers. Our expert technicians always ensure that your water heater is installed correctly and safely, and always in compliance with city building codes, taking into consideration issues including clearance, drip pans if necessary, with correct plumbing and electrical/gas connections. We arrange all necessary building permits. WHEN DO YOU NEED A NEW HOT WATER HEATER? The average residential hot water heater carries a manufacturer's warranty of about six years. Commercial water heaters may carry a warranty of up to ten years. The warranty period should be about half the expected life of the equipment. Over time, water heaters become rusted and will eventually leak. A water heater leaking from the top may be repaired. But if it is leaking from the bottom, it is time for a new water heater installation. A corroded water heater storage-tank cannot be repaired. However, a burned-out heating element, a leaky pressure-relief valve or a leaky drain might be repaired. As a rule of thumb, you can repair your unit if the labor cost - often not included in the warranty - will be less than $50 per year for the remaining years in the warranty. If not, you should buy a new unit. If your water heater is corroded and the warranty has expired, buy a new water heater. We service residential and commercial customers in metro Los Angeles, Orange County, and the San Francisco Bay Area. We are certified distributors and installers of the leading brands of water heaters, including and Bradford White, Rheem, Noritz, Ruud and Rinnai. If you are in the market for a new water heater, you might want to consider a tankless water heater. These systems do not have a traditional water tank: instead, they heat up water whenever you need it. Call it "hot water on demand". We provide our customers with frequent coupons and discounts on equipment and our plumbing services. Right now, take advantage of our incredible deal on residential water heaters: we can install a brand new water heater for you for $899. This includes the price of the unit and the installation. The unit carries a full 5-year manufacturer's warranty. Call the experts at Mr. Speedy Plumbing and talk to a master plumber about getting a new water heater professionally installed at an incredible price.